Our main weekly worship service takes place every Sunday morning at 10.30am. The service can vary in structure with a measure of freedom in our style of worship as we are led by the Spirit. 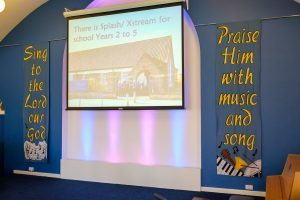 We have both traditional and modern songs, led by our worship band and singers, and all words are projected onto the large screen at the front of the church so that all can read clearly. About once a term we have a Family Service where the children and youngsters take part alongside our singing group and occasional drama sketches. Children and young people normally stay in the service for the first 20-30 minutes and we try to aim our worship to all age groups. After this, we have classes at the back of the church for all ages (Creche for 0-3 years, Sunday School for 3-11 years, The Grid for 11+ years). Further details on each of these groups can be found in Youth Work above. 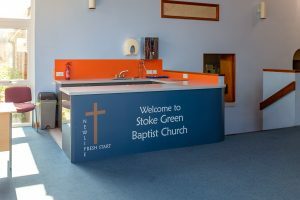 Also, tea, coffee and biscuits are served in the Loaves and Fishes Hall at the rear of the church after the morning service. We celebrate Holy Communion twice a month, normally on the first Sunday evening during our Prayer Service, and on the third Sunday morning. We welcome anyone who has accepted Jesus as their Saviour to take part in this symbol of remembrance and unity.